As I mentioned when introducing this month’s assignment on Color Composition, I was surprised how little I used color that way even though I shoot it exclusively. Upon perusing my photo library, I found the following photographs I remembered taking because of the color in the scene. The first I found on a “trail” on Prospect Mountain overlooking Lake George. I put trail in quotes as it was more like a steep rock face. 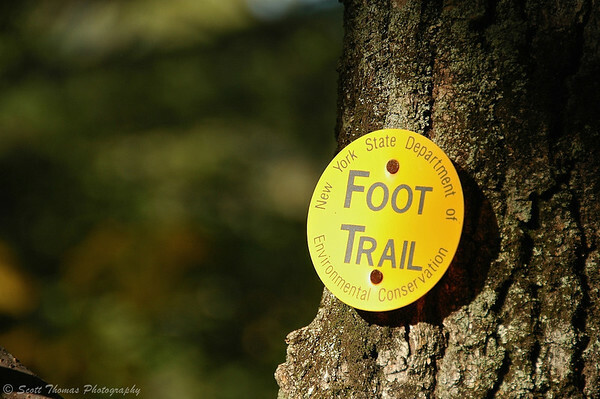 A New York State Department of Environmental Conservation Foot Trail marker on a Prospect Mountain trail near Lake George, New York. Nikon D70/18-200VR, 1/320s, f/5.6, ISO 200, EV +0.3, 200mm focal length. I used two compositional techniques to focus attention on the yellow marker. The first was to use the Rule of Thirds and the second to use a wide open aperture to throw the busy forest background out of focus. Upon re-visiting the 1000 Islands Visitor Center next to the 1000 Island Bridge, I remembered the red covered bridge on the trail behind the Center. Red covered bridge behind the 1000 Islands Visitor Center just off of Interstate 81 in between Clayton and Alexandria Bay, New York. Nikon D70/18-200VR, 1/40s, f/16, ISO 200, EV +0.3, 40mm focal length. 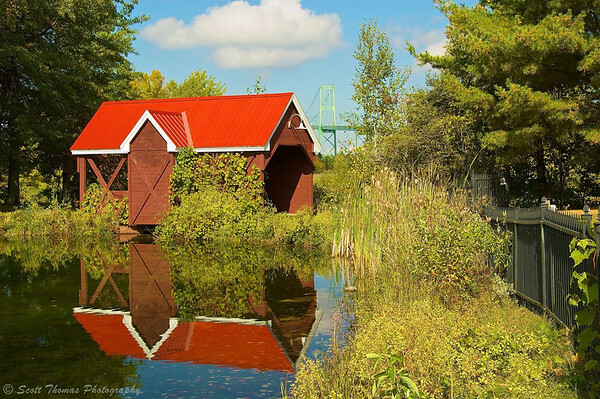 The red roof of the covered bridge draws one’s attention before seeing the other elements in the scene like the bridge’s reflection in the water, the fence along the pond’s perimeter and the 1000 Island bridge in the background. This last example is bitter sweet to share. Chances are the wooden pier you see in the photo near Ocean City, New Jersey is no longer there after Superstorm Sandy passed over the New Jersey shore last week. If you wold like to help people afffected by Sandy, Click Here to give a monetary donation to the American Red Cross. 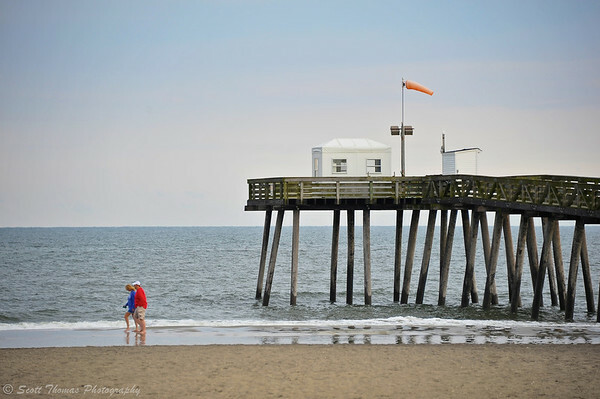 A couple walking past a wooden pier near the Ocean City Boardwalk on the Atlantic Ocean shore in New Jersey. Nikon D700/28-300VR, 1/125s, f/5.6, ISO 200, EV +0.3, 210mm focal length. The brightly colored clothes of the couple walking on the beach immediately catches a viewer’s eyes before traveling through the natural tones of the beach scene. Does not hurt they are positioned near a power point location (see Rule of Thirds link above). These photos are good examples of how to use color to enhance a photo’s composition. This entry was posted in Photography and tagged 1000 islands, 18-200mm vr, 28-300mm, atlantic, beach, bokeh, bridge, color, composition, covered, lake george, marker, new jersey, new york, nikon D70, nikon D700, ocean city, pier, prospect mountain, red, reflection, trail, vr, water, wooden, yellow. Bookmark the permalink. Excellent pictures to illustrate your next photography challenge. I love the third one I already admired on flickr. Thanks for the helpful links too. You’re welcome, Isa. Looking forward to your photos. These are beautiful, Scott. I am particularly drawn to the Ocean City shot because of memories (I’ve vacationed there — and grew up in New Jersey where we spent part of our summers at the Jersey Shore). Seeing the after-Sandy pictures has been heartbreaking. I’ve just found out about your assignment (my email subscriptions are a mess lately and I’ve lost quite a few for no reason I can fathom), and have been visiting the links in the assignment to get some idea of what you mean. Now I’m off to look and see what I’ve got in the archives. Or maybe I’ll come upon something while out on my walks. I know what you mean. My family loved the Ocean City Boardwalk. So much nicer than Atlantic City. Following the Ocean City FaceBook page, looks like the boardwalk did not have the devastation we saw at AC. The island seems to have been more affected with flooding. Here is hoping they can get back on their feet by next Spring. I bet you can find lots of color even this late in the year on one of your walks. If not, your archive is rich in color but were you aware of it when you were taking the photos? That is something I really do not do as much as I thought I did.